We had just finished watching an early showing of Hop--the best live action/CGI Easter Bunny film ever--and it was Happy Meal's turn to choose. He went with Islands, because he liked the chicken strips there--I should have followed his lead. Instead, I ordered the Kevorkian (Assisted Suicide) burger. On the menu, this was known as the Big Wave w/Cheese. 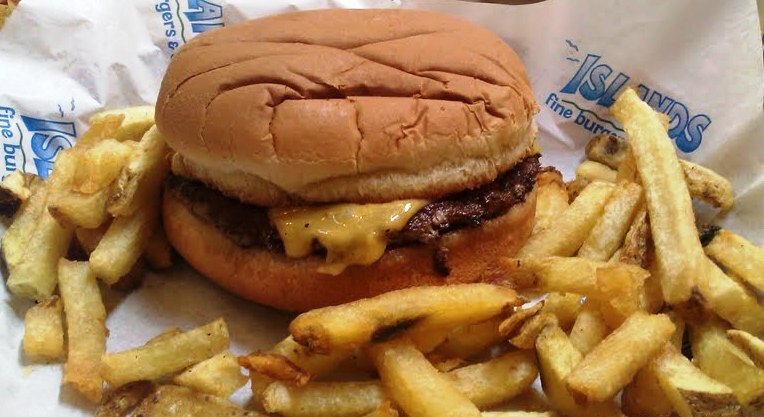 It was the basic cheeseburger--it was $9.69, and it weighed in at 1,230 calories. I vowed to only eat half, and Islands made that decision easy by not serving up a n unpleasantly greasy burger. The Beef: This was some greasy Chuck. It was mildly beefy with a faint taste of aging. Mostly it was brutally greasy--this gave it a creamy texture, which was unwelcome when combined with the other textures in the dish. The beef was juicy, but the grease overwhelmed that. The Seasoning: Islands barely dusted any seasoning on the insipid patty. The Sear: The sear looked to be phenomenal on the half of the patty that was covered in cheese, but the side to which I had access was not seared--just wet and gray. The Preparation: The patties were cooked to a perfect Medium on a large, gas-fired griddle. 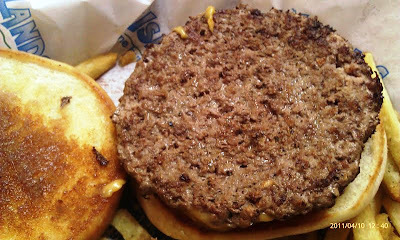 The beef was formed into uniform, thin 7 ounce patties. The grind was medium. Aside from delivering half of a sear, the preparation was adequate. The Cheese: This was the highlight of the dish. The thick slice of wonderfully melted American cheese provided the only true goodness in the dish. The cheese was gooey, salty, and flavorful. It dominated the flavor of the weak beef. The Bun: The standard hamburger bun was ridiculously greasy. They brushed a copious amount of butter onto the top and bottom bun prior to griddle toasting. The result was a mouthful of buttery grease. It was very unpleasant. The Meat to Bun Ratio: This was fine. It just did not matter. The Fries: The fries were nicely cooked. They were crisp, golden, and par-cooked. The oil was fresh, and the fries retained their crispness as they cooled. However, they received no seasoning, so they were boring. Note the depth of butter on the bottom bun. The Value: 10 bucks for a bland, greasy cheeseburger with bland fries was a very poor deal. The tagline on the Islands marquee was "Fine Burgers and Drinks". I assure you, the burgers were pretty freaking far from fine. This is a burger to be avoided. A single burger came in at well over a thousand calories, and most of those calories were from fat. Burger Review : Pretty awful....one of the greasiest things that I have ever tried. 50% of it left me with stomach pangs. The chicken strips were OK.